I am a cheater... I admit it! O=) I vow never to eat Cheesecake Factory ever again because of a disgusting incident and the sad thing is I used to love it... don't judge me! lol So what do I do to circumvent eating at Cheesecake Factory... 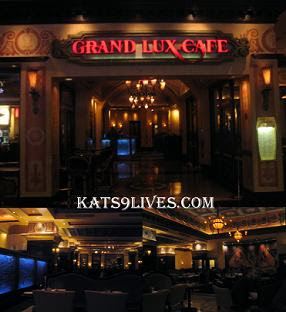 I go to Grand Lux Cafe, which is the brother restaurant or Cheesecake Factory. Mwahahah It doesn't count. ^_^ Also, you can't blame me for going here recently with Alldark *Mr. L*since it was 2AM in Vegas... there was almost nothing open... if you can believe it. Originally we went to get Carne Asada French Fries but the places was out of potatoes! Unholy! lol At first we went to the Grand Lux Cafe in the Palazzo but I guess they changed their hours and isn't open all night any more so we walked over to the Venetian. We were seated immediately. Sadly, they offer a small menu for this late at night. I normally get the Miso Salmon but that was not available so I decided to order the Shaking Beef for once. It has always been one of my favorite dishes but I think it is way overpriced for the amount of meat you get. Pieces of Tenderloin, Red & Green Onions are stir fried with Mildly Spicy Marinade and served with Steamed White Rice. I don't know if it was an off day or not, but the flavor was not on point and I found it to be too salty. Even though most dishes eaten with rice are usually a little more salty to compliment the flavor, but this was too much. I poured the citric sauce on top to help mellow the saltiness but it didn't quite help that much. The meat was a little overcook for my liking. I will still come back to get this one day but with more careful instructions of how I want it done. KyoChon : It's About Time! Ocean & Vine : Pretty Good Deal For DineLA Week! Scarlet Tea Room : Feeling Dainty! Red Lobster : What I Do For Ms. Lin!